As John Lennon wrote, “Life is what happens while you’re busy making other plans.” My last two weeks have been very much like that. Still, I have difficulty shutting off my mind and things were happening back in the States. I may live in Italy and love it all but my family in the USA is never far from my thoughts. My Papa’ has been suffering from a slow slide down the rabbit hole into dementia. He still does well in many aspects of his life but has begun to forget things that could hurt him. We siblings made the decision to move him into assisted living against his will. Dad was very upset about the move. I had taken my father there to visit around Christmas. He liked the place but did not believe it was necessary for him to move. I had planned to be there for the move, but a lovely apartment was immediately available, and it was only 2 doors from Auntie Roro, dad’s sister, and Uncle John. The hour-long phone calls began around the 20th. It was heartbreaking to hear him say, “Why do I have to go? I take care of myself. I am fine.” I would have to repeatedly calm him, explain the reasons he needed to move and all the reasons we thought it would enhance his life. We spoke at least once a day for nearly two weeks. It is my role as a dutiful, Italian Daughter, to be there for my parents. I learned this growing up in an Italo-American community. It’s the daughter’s job. Some of that obligation is in my head. But it gets loud in there. And the guilt, although unnecessary, remains. With the time difference I was usually talking with him at midnight in Italy. The stress of keeping my calm and the emotions of grief and heartache prevented me from sleeping. I probably slept less than 4 hours per night. Why couldn’t I go to Minnesota at this time? My new, 5-year apartment lease was to be signed on March 1st. My landlady was coming from Parma to sign the paperwork and assist me in changing over the utilities. We were set to see each other both on the 1st and 2nd of March. 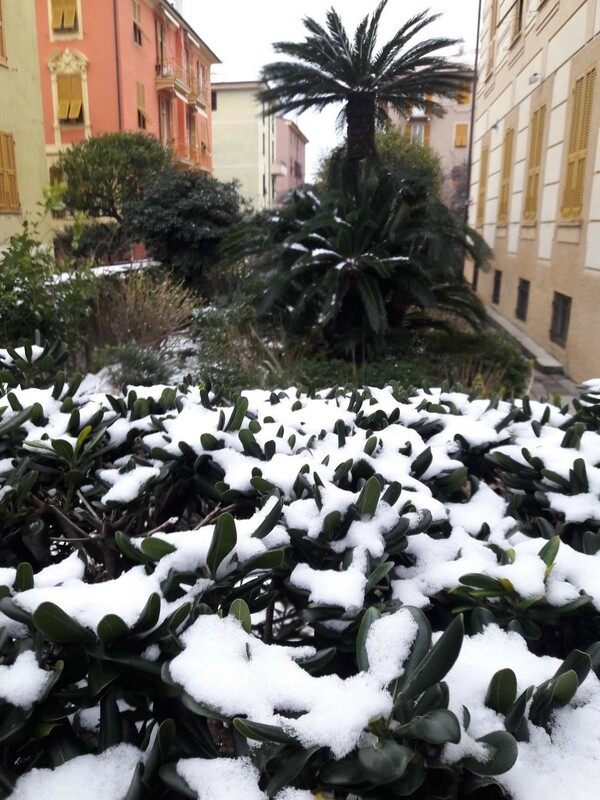 March 1st and 2nd were the days of SNOW and freezing weather in Chiavari. What? Snow? La neve, snow, is a very rare event here. And I walked 20,000 steps on those two, cold days. But it had to be done. I now have Chiavari as my prima casa, my residence, my home. Prior to the lease appointment, I had planned to meet new friends visiting Chiavari from the States. John and Anna, brother and sister, have their Italian roots right here in Chiavari and the surrounding area. Anna and I met one another on Facebook. Our first, in person meeting occurred along the Promenade where we chatted and drank cappuccino for hours. We then arranged to meet next day to visit the area where part of her family originated, the hill town of Borzonasca. This placemat map shows Borzonasca near the center. And encountered medieval stone structures still in use. Right beyond this point, we walked to the upper level of the photo above. I was taken by the beauty of the surrounding area. With trusty NIKKON camera in hand, I took one extra step to get that perfect photo. And I fell, tripping over a landing protruding into the street, hurt my recently healed foot, smashed my backside down so hard that my head and camera swung wildly, and both hit the stucco of the home. My NIKKON was damaged. I think at that time I hardly felt anything but embarrassment. A golf ball sized bump grew above my left temple. I strained my neck. I have black and blue marks on both legs and my hand. And I needed to ice my foot for days. I think I need the Madonna above as my protector. Or this shrine? I did appreciate visiting this ancient community. It is an out of the way locale where you can see life as it has been for centuries. And I found a few signs amusing, especially this one. After our bus ride back to the center of Chiavari, we visited my new friends’ ancestral home. It is not far from where I live, has been in their family since it was built in the 1800s, and we peeked into la camera da letto, the bedroom, of their beloved Zia, aunt. The furniture and artwork and the faux painted ceiling were glorious. Thank you for sharing your family home with me, Anna and John. I wish I could have spent more time with you after we met. But I had obligations and ended up aching all over. I thought it was all from the fall until my breathing became dramatically labored. Yes, I got sick again. I wore my hat and scarf. I kept my neck warm as a good Italian does. But it wasn’t enough. I’ve been home recuperating for over a week. It is getting better. But with all that time on my hands and lack of sleep I have been replaying the wild ride. And I speak with my father every couple of days now. When he is sad, I do my best to support him. And I think of him at his table in the morning, eating his breakfast of champions as only he can do. Three types of cereal combined with milk, two prunes, water, decaf coffee and TANG, just like the astronauts drink. That’s my dad. This is not la vita far niente, the calm, relaxed life we all dream of experiencing when we visit or move to Italy. This is the grit of life that we all experience no matter where we live. For me, the joys outweigh the stress and down time. Finding people who love Italy and Liguria as I do, making new friends, visiting out of the way places, and listening to the waves while inside my home recuperating, all these things are make life worthwhile. I can get sick anywhere. I can stress over paperwork and my ability to read a legal contract in the States too. But I would rather not. Now, I must say farewell. I need to finish my own travel plan for next month’s adventure in France. I also have two clients, families like yours, who need my assistance with their upcoming Italy travel. Let me know when I can assist you. A dopo.